WhatsApp is a cross-platform messaging app that can be used in iOS, Android, Blackberry and Windows mobile. Although Android has the default Hangout app shipped for free with Android phones, a large number of users tend to replace Hangout to WhatsApp due to its multiple platform support and functionality. You can easily send text messages, photos, voice and video across different devices without paying extra fee, the only requirement is to have WhatsApp installed on the device. However, Hangout is only available for Android powered devices. It means you can't send messages for free from Android to other non-Android mobile phones. As WhatsApp favored by hundreds of thousands end users, it plays a more important role in our daily life. So what gonna to do if you accidently deleted some critical messages or uninstalled WhatsApp by your little child? I guess the first thing coming to you in mind in such situation is how to restore deleted WhatsApp messages on Android. But unfortunately, WhatsApp official hasn't provided a recovery method yet to help out the troubled users because they don't transfer chats to their back-end servers to protect privacy. Any workable solution available for recovering WhatsApp messages? Yeah, it really exists. 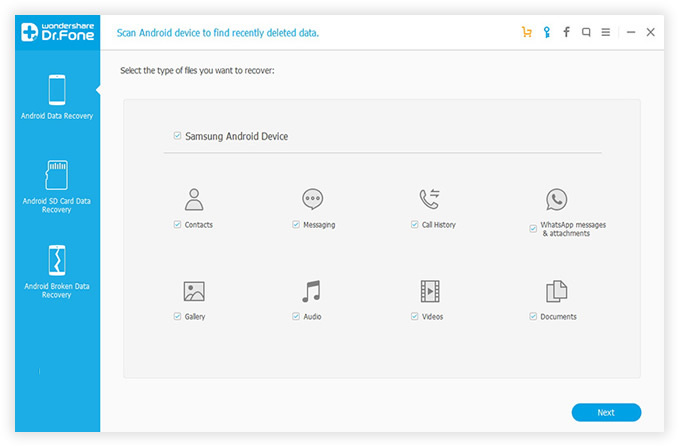 Android Data Recovery is a full-function recovery app developed for the purpose of data restore. It can easily recover deleted or lost WhatsApp messages and even WhatsApp attachment sent during chats. Besides WhatsApp messages recover, other items such as photo, contacts, videos and documents are fully restored either. It supports 200+ Android phone manufactures and 3000+ Android phones. Supported Android Devices: 100+ brands and 2500+ smartphones. Download the software via above download button and install it on your computer by following the default installation wizard. The software has a 30-day free trial so you can use it freely in this period. Open the program when the installation is completed. Note: Make sure Android USB Debugging is turned on, or the software will not proceed to the next step. Connect the Android phone on the computer via USB cable. Once it's well attached, the program will detect the device automatically and scans the data and files stored on the device. The scanning process takes a few minutes to finish, please make sure the battery capacity is over 30% during this step. The program will list all previous WhatsApp messages stored on the device and you can preview each one by clicking on the specific message. Then you can decide which one to be recovered. After selecting the desired messages, then it's time to proceed to the next step. 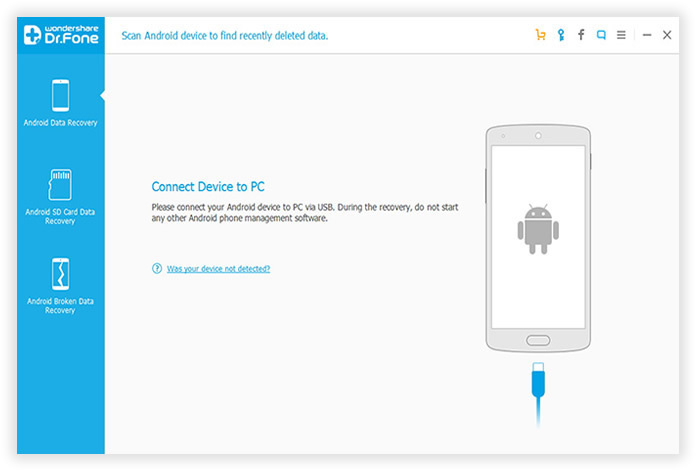 Click on Recover button located on the bottom of the main screen to start the recovering process. The full recovery can be done in a few minutes to an hour, depending on how many files being recovered. This Android Data Recovery software is the best among its competitors when regards to features and simplicity. 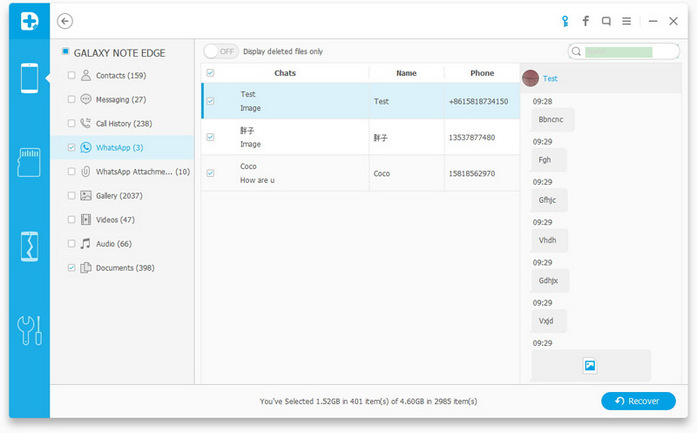 With this app at hand, you don't need to worry about data loss any more. All your Android data is under cover by this app. Have fun with your device and forget about the worries.